My recent iOS project, Aimeiwei, is an image-oriented app focused on food. We use lots of images, and one picture user updated can have two different aspect ratios, one is the original square food picture, and one is a cropped rectangle picutre that can possiblly be used as the restaurant’s header image. I utilized EGOImageLoading to cache and display images from our remote server. But I came across a strange problem: Sometimes the rectangle image view displays the square one instead, dispite the fact that the urls of the two images are different and the url of the rectangle one points to the correct rectangle image. The hash is a convolution of the first and last eight bytes plus the length of the string basically the byte values are shifted and added to the string length. I do know that the hash result is not guaranteed to be unique, but I don’t expect a “weak unique” like these. The implementation of hash must have been improved after these years because the data provided in the article no longer give the same result. But as of now 2012, on iOS 6 SDK, those two urls in my project still yield the same hash. The fix is simple, just use MD5 as the key. Now I use this fork instead. If someday I had time, I may give SDWebImage a try. 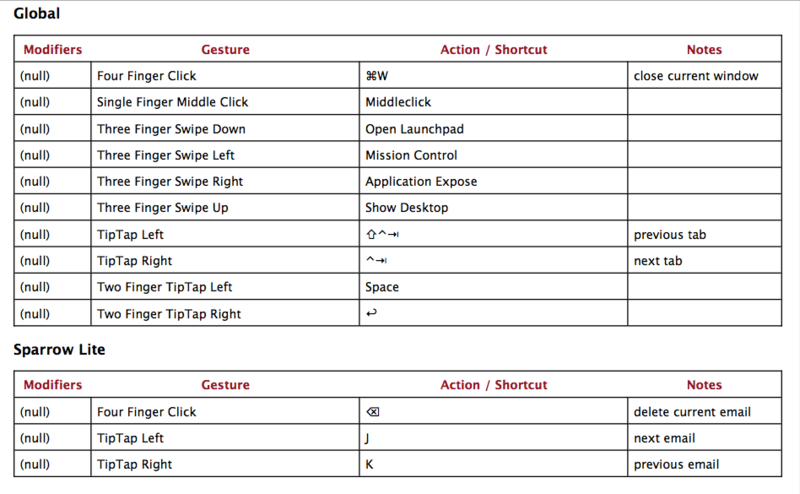 You can download my config here and import to BetterTouchTool directly. Octopress offers an atom.xml feed only. But many other blog providers’ default feed is different from this, such as /feed on wordpress. So how to move your existing blog subscribers smoothly from your old blog to Octopress? Rss feed address can be change by modifying the subscribe_rss value in _config.yml. But this only change the url for the feed link on your page. It won’t generate a feed there. Then how do you generate a feed there? just ssh to the server and do $ ln -s atom.xml $your_rss_file, then you are done. If you host your Octopress on heroku or github, then you have no ssh access to the server. You can redirect the request. Details can be found in the redirect part of this article, and code can be found here. You can simply copy the atom.xml in your source(not public) directory to any location in the source directory or its sub-directory. But this method has a little disadvantage, that due to your have two(or more) same feed source files now, Octopress will generate the rss feed more than one time. But that would not be a problem. desc "copy atom.xml to feed_files"
Methods above serve well if the feed you want is somehing like rss.xml. But there is still a little problem if your old feed url is like /feed. Since in github pages, the content-type of a file is determinate by the file extension. The response content-type of the request to /feed is application/octet-stream rather than text/xml as a normal rss feed. When user clicked on the /feed clink, it eventual downloads the feed file other than displaying the feed content or bringing up the Rss subscribe interface. And even if you add the address to google reader manually , although it can read the content first time you import this feed, you can’t get further updates. What is worse is that github has no support for .htaccess or other ways to redirect /feed to atom.xml. After searching a long time and no solution was found, I almost gave up. But suddenly I came up with an idea: how about look /feed as a directory rather than a file? Then the /feed request eventually redirect to /feed/index.html, and the content-type can be specified in the html. I tried that. And it DID WORK! When you are filling the values in _config.yml. A space need to be added between the value and the colon after the key.